We are pleased to announce that our 1s have been promoted to WML Premier Division East for the 2018 season, and that we have again secured Magdalen College School for Winter training on Sundays from 6:00-7:30pm. The indoor league is a mixture of development and more experienced players so is a great way to get back in and play some cricket early on in the season! Last year we entered two teams, it was great fun and the Oxford Kites were crowned Indoor champions too! Confirmed dates for the 1s and provisional dates for the 2s have now been published (subject to new teams entering the league). Our league matches now take place in April and July–September as a result of the new County and KSL Women’s Super League schedules. New T20 knockout and 8-a-side competitions are in the pipeline to ensure that there will be plenty of weekend cricket during May and June, plus our usual midweek matches and softball cricket festivals. We will produce a full fixture list when we have more details. It is important that as many club members as possible attend from all sections of the club. Please come along if you can! We are very pleased and excited to announce that OxCC Women have be awarded a fixture against the MCC Women this coming season. If you would like to play for OxCCW in this match please let us know (we’ll be asking for availability for all of our matches in the next month or two). Oxfordshire Association of Cricket Officials will be running update sessions on the Law changes for 2018. There are many changes to the Laws that will impact directly on all levels of cricket so it is important that all those involved in the game are aware of and understand the changes. These sessions are open to everybody in the game, umpires, scorers, coaches, captains, players, parents and are free to attend. Sessions will last approximately 2 hours. If you are unable to attend this workshop, others dates/venues are available – please see the Oxfordshire Cricket website for details. We’ve love for everyone in our teams to know how to score a cricket match! The ECB are now offering a free online course that is suitable both for complete beginners and existing scorers who want to improve their skills. On completion of the course you’ll receive an ECB ACO club scorer certificate. This course is designed to build on Umpire Education Stage One, covering further Laws and exploring the concept of working as part of a team with a colleague and the scorers. It is intended to introduce umpires to the skills and knowledge required to be members of a league panel. It is envisaged that participants, having completed the course, refresh their understanding of these Laws and study them more thoroughly by referring to the MCC on-line Laws Course. The 1s had another good season, finishing second in Women’s Midlands League D1 for the third year in a row. This season really showcased the depth of the women’s side of the club, with 28 players featuring in the 1s in 2017! A number of younger players were called up and performed extremely well in their debut season for the 1s, impressing with their solid performances batting and bowling. Two of our stalwarts headed our leaderboards. Emilia Bartram topped the wicket takers, with 16 wickets at an average of 9. Vice-captain (and often full captain!) Genny Porter scored the most runs over the season, with 125. As always, playing in the 1s has been the highlight of my summer, with lots of camaraderie, delicious teas, and great cricket. I would like to thank the players, their families, officials, and club members who make playing for Oxford such an enjoyable experience. Ellie Bath. After showing that we could be competitive in the division, the 2s were pipped into 3rd place in Women’s Midlands League D4 South. Top performers with the bat were Numa Shah and Tammy Mattinson, who averaged 136 and 52 respectively, plus the captain’s 122* vs Westbury. It was great to regularly toss the ball to Lily Priscott, our top wicket-taker, to open the bowling, and a number of our bowlers averaged in the tens and below. In a season when we didn’t always have 11 players, I was glad that Camilla Charles and Ros Porter were available for nearly every game. I’d also like to massively thank everyone who borrowed kit to help us out at short notice – in the end, 48 players represented our two teams on Sundays. The focus on positivity, enjoyment and fun, while playing to win, was the biggest highlight, and I’d like to thank all of the players, parents and partners who made this possible. Heather Lang. We also had a team in the Women’s Midweek League, the Kites, playing on a Tuesday evening throughout May and June when the weather allowed! This culminated with a great Finals Day at Charlbury CC at the end of June. We played a number of friendly fixtures against Langford Ladies, Thame Ladies and a touring side from France, Nantes Ladies. All played in a friendly but competitive spirit and were a great success. 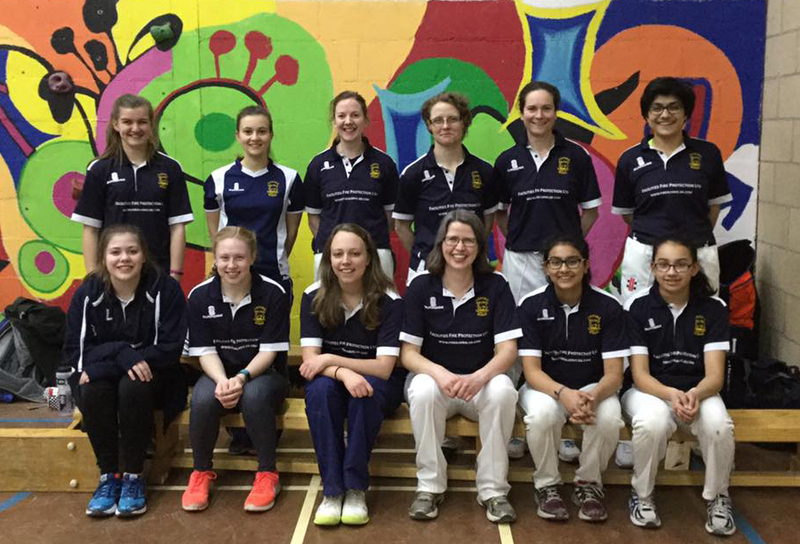 Following a very successful softball cricket course run for women on a Friday evening alongside the Youth training, OxCC Women entered the Harriers in the softball Tournament at Banbury CC in August, which they won! We organised a very successful Bring and Share Supper at Jordan Hill to celebrate the end of the Women’s season. It was an opportunity to say thank you to the many people who support the women’s sides throughout the season including the coaches, umpires and scorers. We always welcome volunteers whether they are players or non-players. There are a number of ECB courses on offer which enable you to support the club. If anyone is interested in taking one of these courses then please email the club account oxfordccwomen@gmail.com. This is a joint event with both the Men and the Women’s sides to celebrate the club’s 2017 season. We look forward to seeing players and their families at this event. Starters – Mini patties served with dipping sauce or Vegetarian Soup. Main course – Chicken curry or Vegetarian Curry served with plain ice, sauteed new potatoes, salad & coleslaw. All meat used will be halal. The dress code will be smart/casual – please don’t wear your whites. Presentations will begin shortly after the food. Tickets are available to purchase via clubpay through this page. Details will be emailed out to all members and will be announce on the club social media sites. If you know of anyone who is interested in playing for us next season, do get in touch via the club email account: oxfordccwomen@gmail.com. Great start to the 2017 season! Fantastic wins for both the 1st XI vs. Pershore and the 2nd XI vs. Brackley in their first Women’s Midlands League matches of the season. We train on Tuesday evenings at Jordan Hill from 6pm until sunset. This season we have three coaches on a Tuesday evening, Paul Gladdy, Sara Morgan and Aaron Hirtenstein. We are delighted to welcome Paul back to the Tuesday evening coaching sessions with Sara; they will be mentoring Aaron, who is currently doing his level 2 coaching qualification and plays for Oxenford CC. Friday 5th May sees the first of 6 sessions of Women’s Beginner Cricket (kwikcricket), at Jordan Hill from 6.30 – 7.30pm, in conjunction with Oxford City Council. If you know anyone who would be interested, please pass on the details and encourage them to come along to the first session. No experience is necessary! If you’re at a loose end on Friday nights and want some Cricket fun, join us at Jordan Hill to inspire the next generation of young cricketers! We’re looking for helpers to support our qualified Junior Coaches with our squad of 5-8 year olds. Adults and U18’s are welcome to get involved. You don’t have to have any experience of coaching – just enthusiasm! Also, we are always looking for more help with the youth section with coaching, scoring, helping with the BBQ and registrations. For more information or if you can help please get in touch. 2017 Subscriptions are now due! PRIZE DRAW extended until 7th May. Pay your subs by the 7th for a chance to win a pair of tickets to THE WOMEN’S WORLD CUP FINAL at LORDS on SUNDAY 23RD JULY 2017. Congratulations to the Kites and Furies, who have finished in the top four and are heading to the playoffs. Finals day is 28 March from 8–10pm at Matthew Arnold School – come and support! Thank you to our Kites sponsors, Facilities Fire Protection Ltd. Note: there is no fixture on Sunday 23 July as it’s the Women’s World Cup Final at Lord’s. Book your tickets now! Mon 3 April (evening): help with covers and nets at Jordan Hill Sports Ground. Sun 9 April (10:30am): NatWest Cricketforce Work Day at Jordan Hill Sports Ground. Please come and help get the ground ready for the 2017 season. 5 days of matches in the beautiful surroundings of the Malvern Hills. B&B locally or camp at the Cricket club.